Projecting players at the NFL level is always a challenge, but certain positions inherent more uncertainty than others due to the difference in college and NFL usage patterns. That’s the challenge with safeties who often fill completely different roles in the NFL compared with their work in college. 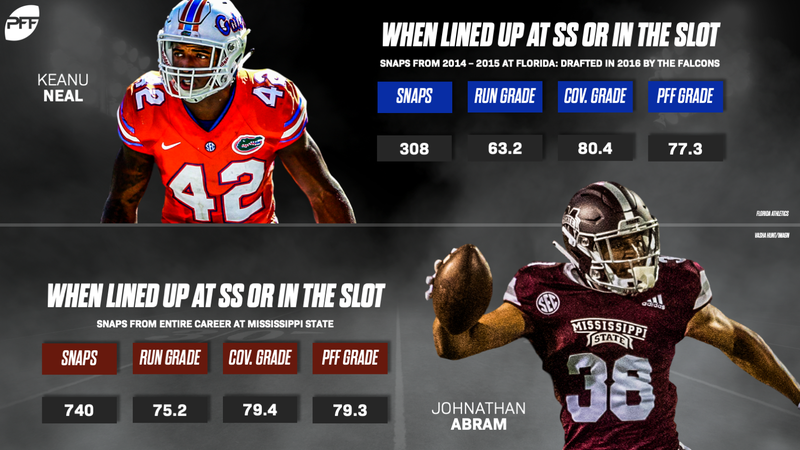 Mississippi State’s Johnathan Abram has received first-round hype from many draft analysts, but his success will depend heavily on his NFL scheme fit. While PFF data has done an admirable job of pointing us in the right direction of successful NFL players and steering us away from those who are unlikely to produce at the next level, there are a few misses along the way. 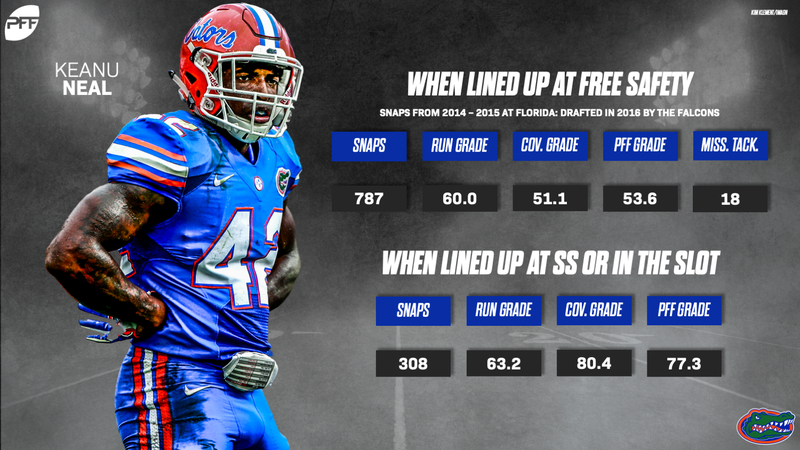 Atlanta Falcons safety Keanu Neal was a curious first-round pick back in 2016, especially after we saw him post a middling 65.6 overall grade at Florida in 2015. However, Neal was thrust into a strong safety role in Atlanta’s scheme that perfectly fits his skillset as a box run defender and middle-of-the-field enforcer. Neal was often asked to play more of a deep free safety role at Florida and that affected his play-by-play production, but with a bit of revisionist history and a deep dive into the PFF database (we’re still learning where our data best projects), we find that perhaps the Falcons were onto something. Neal was clearly a better strong safety than free safety in college, and the PFF data bears this out. So what does this have to do with Abram? 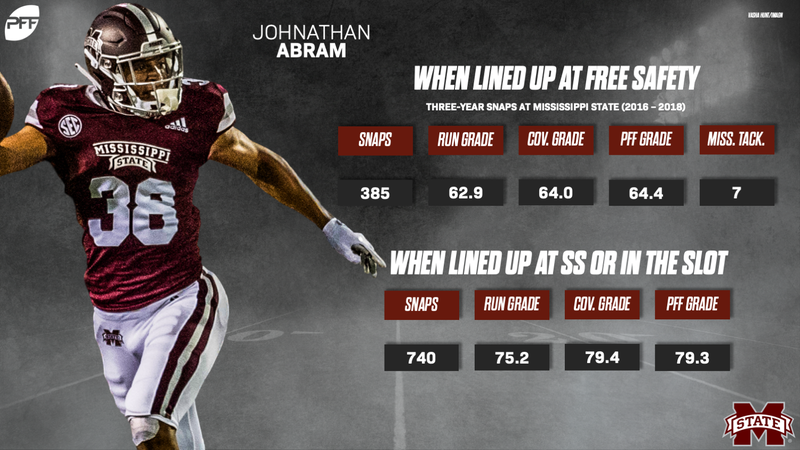 We may have a similar situation on our hands as Abram enters the NFL draft with pedestrian PFF grades in three years of action at Mississippi State, but a deeper dive shows that a Neal-like role at the next level could work with his skill set. When watching Abram on tape, he screams “strong safety” with his straight-line speed, short-area range and ability to pack a punch on ball carriers and underneath receivers. The data backs this up as Abram’s career grades when lined up at strong safety or in the slot are far better than his work when playing free safety. In fact, the splits are eerily similar to Neal. Both Abram and Neal posted solid overall grades when playing more of a strong safety role with near-identical coverage grades and Abram edging Neal as a run defender. The comparison doesn’t stop there as we fire up Neal’s free safety numbers which are once again, very close to Abram’s. Both players see a significant drop in all facets, with a massive coverage drop for Neal. Perhaps most alarming is the difference in snap count as Abram has played 740 snaps as a strong safety/slot compared to 385 at free safety, while Neal was almost the inverse with only 308 snaps at strong safety/slot and 787 as a deep safety. It shows just how often Neal played out of position, hurting his overall grade, and how Mississippi State at least put Abram in position to succeed at a higher rate. 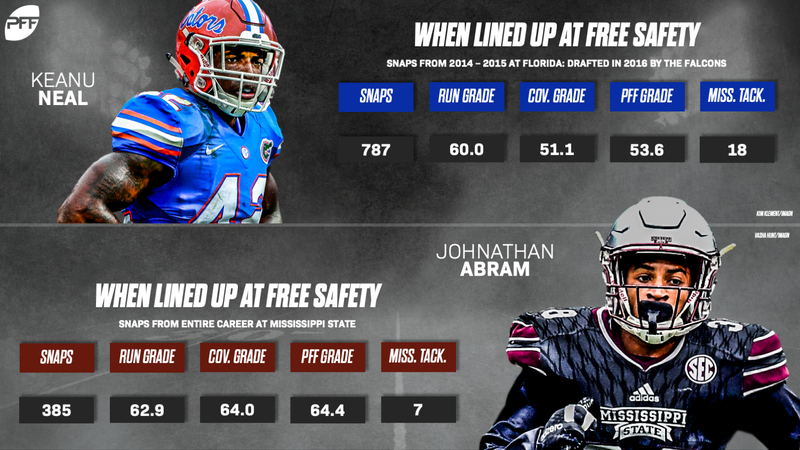 Overall, Abram is not a first-round prospect on the PFF draft board as there are still plenty of questions about his game, but like Neal, he can have an impact if used in a traditional strong-safety role at the next level.